The benefits of dark chocolate are becoming more and more widely known, which is a great thing for those of us who are chocoholics! Let's face it. When you tell people that you're a chocoholic, you will get varied responses. Others may happily agree that they, too, love chocolate - kindred spirits! If you do find a kindred spirit who loves this sweet dessert as much as you do, fantastic! Truth is, that happens more often than not. It's rare that I find people who don't actually "like" chocolate. I have a friend who can "take it or leave it" but someone who actually dislikes chocolate? Rare indeed! Most often, I've found people who love chocolate, but are kind of "afraid" of it. Yep! Chocolate can get a really bad rap. But the truth is, the dark chocolate antioxidant benefits are even recommended by doctors these days! Dark chocolate is mainly cocoa. Cocoa is a source of an antioxidant called flavonoids, and regular consumption of flavonoids can actually help you avoid chronic illnesses. Flavonols are even good for your heart health! Obesity, high blood pressure, and diabetes can be prevented with the long-term consumption of dark chocolate. Well, not by eating dark chocolate alone, of course, but it CAN help. In the past, it has been thought that chocolate was one of the reasons why these problems persisted, but in fact if you choose your chocolate wisely, you can actually help keep out of harm’s way. 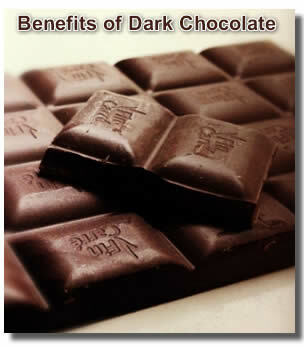 Dark chocolate, high quality and processed correctly, is beneficial to the blood in many ways. It provides vitamins, minerals, and nutrients that improve your blood quality and contribute to better health. Dark chocolate can improve your mood and brain function. Surprised? By increasing blood flow to the brain, cognitive function is improved as well. Some of the natural chemicals found in chocolate give you that "feel good" experience. Learning these benefits of dark chocolate will not only make dark chocolate more appealing for chocolate-lovers like me, but it can also persuade others to try it out every once in a while - for their "health" of course! Chocolate tastes good! Sometimes it can even taste better with the addition of extra sugar, nuts, fruit, and other flavorings. We need to keep in mind that not all of these "extras" are healthy. When choosing to indulge in chocolate, it’s still best to choose dark chocolate because of its healthy properties aside from other variants that do not have the same benefits.